They are named Kemp’s after Richard Kemp, who helped discover and study them. Their carapace oval in shape and olive green to gray in color while their plastron is typically a light yellow. 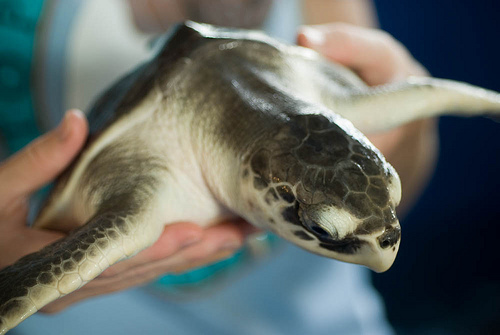 The Kemp’s ridley is the most endangered sea turtle; their decline resulted from egg poaching and interactions with the fisheries industry, primarily becoming trapped in trawl nets. This is also the smallest of the sea turtles, with adults reaching only about 2 feet in length and weighing just over 100 pounds maximum. They have powerful jaws, allowing them to feed on crabs, clams, mussels, shrimp, snails, sea urchins, sea stars, fish and some saltwater plants. Kemp’s ridley turtles follow two major migratory routes in the Gulf of Mexico: one northward to the Mississippi area, and the other southward to the Campeche Bank, near the Yucatan Peninsula. 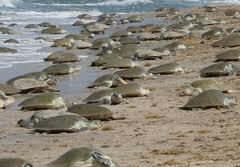 Ninety-five percent of all nesting occurs in daylight on Rancho Nuevo beach on the eastern coast of Mexico between May and July. Female Kemp’s typically lay three clutches of approximately 100 eggs, which incubate for 50-60 days. This species comes ashore in mass synchronized nesting called arribadas, Spanish for “the arrival.” In 1947, an estimated 42,000 nesting females were documented on film as they were coming ashore to lay eggs on a single day! In 1995, only 1,400 ridleys nested at Rancho Nuevo.